It is politically correct to claim that “race” is just an artificial social construct. But of course “race” is real. It is about ancestry and about genetic differences that are quite real. It is about the groupings of peoples exhibiting the same genetic variations. Genetic studies are increasingly confirming the genetic differences that are distinguishable among the many ethnic groups of humans. Genetic groupings exist and are real but they are dynamic, not static. The genetic groupings (colloquially “race”) were different 1,000 generations ago and they will be different again in the future. “the Inuit and their Siberian ancestors have special mutations in genes involved in fat metabolism. The mutations help them partly counteract the effects of a diet high in marine mammal fat, mostly from seals and whales that eat fish with high levels of omega-3 polyunsaturated fatty acids. Those genetic mutations, found in nearly 100 percent of the Inuit, are found in a mere 2 percent of Europeans and 15 percent of Han Chinese, which means that these groups would synthesize omega-3 polyunsaturated fatty acids differently from the Inuit. …. These genetic mutations in the Inuit have more widespread effects. They lower “bad” LDL cholesterol and fasting insulin levels, presumably protecting against cardiovascular disease and diabetes. They also have a significant effect on height, because growth is in part regulated by a person’s fatty acid profile. The researchers found that the mutations causing shorter height in the Inuit are also associated with shorter height in Europeans. 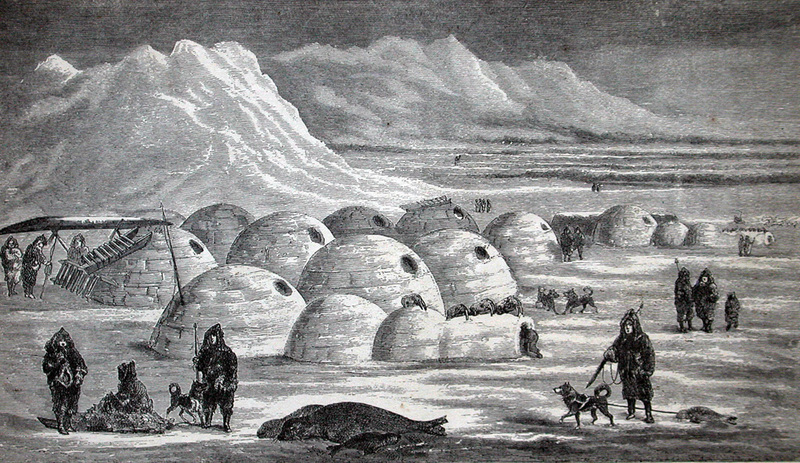 Seals and walruses were part of the traditional diet of the Inuit, as seen in this illustration of a native village on Canada’s Baffin Island, from the book Arctic Researches and Life Among the Esquimaux (1865) by Charles Francis Hall. Nielsen noted that this is some of the clearest evidence to date that human populations are actually adapted to particular diets; that is, they differ in the way they physiologically respond to diets. Just as genome sequencing can lead to personalized medicine tailored to an individual’s specific set of genes, so too may a person’s genome dictate a personalized diet. Nielsen and his colleagues at UC Berkeley and in Greenland and Denmark came to their conclusions after analyzing the genomes of 191 Greenlanders with a low admixture of European genes (less than 5 percent) and comparing them to the genomes of 60 Europeans and 44 Han Chinese. They looked for mutations occurring in a large percentage of Inuit individuals but in few or no other groups, which indicates that the mutation spread throughout the Inuit because it was somehow useful to their survival while not essential in other groups. One cluster of mutations — in genes that code for enzymes that desaturate carbon-carbon bonds in fatty acids — stood out strongly, said Anders Albrechtsen, an associate professor of bioinformatics at the University of Copenhagen and a joint project leader. Fatty acids are the fat in our diet, and occur in saturated, polyunsaturated and unsaturated forms, depending on whether the molecules’ carbon atoms are linked together with no, some or all double bonds. Saturated fats are considered bad because they raise levels of cholesterol in the blood and lower the “good” high-density lipoproteins (HDL), all of which leads to plaque formation and clogged arteries. Diets rich in polyunsaturated and unsaturated fats are linked to lower heart disease. Desaturase enzymes convert dietary fatty acids into fatty acids stored and metabolized by the body. The mutations common in the Inuit, once known as Eskimos, decrease the production of both omega-3 and omega-6 polyunsaturated fatty acids, presumably to account for the high amount of these fatty acids coming from the diet. Changing production of one fatty acid affects all fatty acids, however, since they regulate one another in a complex way, Albrechtsen said. Thus, while it’s not clear which specific gene or genes within the cluster is responsible for the alteration in fatty acid metabolism, he said that “when you change the genes that are involved in fatty acid synthesis, you change the whole conversation among fatty acids, and that has a lot of downstream effects.” …… The researchers discovered another common mutation in a gene that is involved in the differentiation of brown, subcutaneous fat cells and brite fat cells, the latter of which generate heat. This may also have helped the Inuit adapt to a cold environment. We have no difficulty in accepting that different populations (effectively different races in colloquial usage) have differences of physical characteristics due to their genetic ancestry. There is no great outrage now that recent studies point to some genetic differences that Tibetans have which may give them an advantage in absorbing oxygen at high altitudes. Similarly there are no screams when other genetic studies suggest that East Africans (Kenyans and Ethiopians in the main) have some genes – or combination of genes – which give them better endurance and therefore – given good nourishment – lead to better performance as long distance runners. West Africans, or those of West African descent, it seems may have some genetic advantages which make them the fastest sprinters over short distances. African genes also seem to give a lower fat content in body mass – which is genetic – and may be one explanation why their performance as swimmers is less than exceptional. That Indians are more prone to Type 2 diabetes than other “races” is not indignantly opposed but just taken for the observation it is. Indian-Americans (3 generations) are already exhibiting lower rates than their Indian ancestry would indicate. Japanese have very low rates of heart disease but already (in less than 6 generations) Japanese-Hawaiians have heart disease rates that are 2 -3 times higher. It is illogical to assume that these genetic variations between different geographic populations ( colloquially “races”) have only manifested themselves as physical variations. It is highly probable and probably inevitable that these genetic developments will also have affected the brain, its functioning and behaviour. And intelligence. If it is acceptable – and not racist – to observe that there are genetic differences in physical characteristics between the “races” of today, then it is just as acceptable and no more racist to observe that there are genetic differences of intelligence between the “races” of today. The taboo against even discussing genetic groupings (race) and physical and mental characteristics (intelligence) and behaviour is illogical. This entry was posted on September 23, 2015 at 8:54 am and is filed under Anthropology, Behaviour, Biology, Evolution, Genetics. You can follow any responses to this entry through the RSS 2.0 feed. Both comments and pings are currently closed. The genetic mutation that the Inuit pocess is a metabolic state called ketosis. Anyone can access it with the proper diet. The inheritable alignment though is quite profound and interesing.